​A chance discovery by Jane Howard, then curator of Honeywood Museum, resulted in the Friends of Honeywood acquiring for the museum a portrait of Robert Burra of Carshalton. It is a sensitive oil on canvas, dating from circa 1790. There are very few portraits of local characters from the past in the borough’s art collection, so the painting marks an important find. Burra set up a textile business with Thomas Rowlandson, in Watling Street, London, near St Paul’s. They were known and traded as Manchester Warehousemen, a term given to those who traded in cotton goods and calico. Robert probably chose to raise his family in Carshalton because the village was a most desirable suburb for city businessmen and merchants. Although Carshalton and the Wandle were renowned for their calico enterprises, this was probably not an important factor in his choice. You can see two monuments to members of the family in All Saints Church, Carshalton. This picture is on display in the Carshalton Village Room. ​Bought by the Friends for Honeywood, this charming watercolour, painted by local artist John Stillman, depicts the 2012 Olympics celebration in Carshalton which took place outside Honeywood Museum. The painting shows the elegant Swan stage (which hosted a wide variety of performances) on the pond with Honeywood in the background. We can’t think of a better way to commemorate such a special occasion than with this painting which the Friends bought for Honeywood Museum. The picture hangs in the hallway between the Billiards Room and the Drawing Room. ​At the beginning of October 2014 The Friends were contacted by an antique furniture dealer about his acquisition of what he described as an oak Hall chair. He noticed that the chair was stamped Marion & Co, the leading photographic supply company of the late Victorian period, and whose managing partner John Pattison Kirk created and lived in the Honeywood we know today. He wondered if as well as the photographic business, Marion & Co also stamped furniture at their Soho premises. The answer seems to be in the books published by Marion & Co in the late 19th century, in which they refer to providing a bespoke service to equip and furnish home studios for their clientele. As Marion & Co did not trade in furniture it seems evident that this chair was part of their studio range of accessories. The committee of The Friends thought the Studio chair would make a fine addition to our Marion collection and after a helpful and fruitful negotiation with the dealer, the chair was acquired and is now at Honeywood, and may be found in the Billiards Room. In the mid nineteenth century the science of photography was taking huge steps forward and beginning to have an impact on everyday lives. One of the great pioneers in the field of imaging was the firm of Marion & Co. founded by Augustin Marion in the early 1840s. From 1846 their premises were in Regent Street before moving to much larger facilities in Soho Square, where a long association saw 22 & 23 Soho Square evolve into the home of modern photography. In the twentieth century, amalgamations and the development of the business saw Marion evolve into the Ilford photographic empire and ultimately Rank. The first ventures of Marion were in the production and marketing of visiting cards with a photograph on one side and business details on the reverse. This soon provoked a collecting craze of almost unimaginable proportions amongst wealthy middleclass Victorian homes with the Carte de Visite becoming a miniature portrait with studio and photographer’s name often appearing on the reverse. 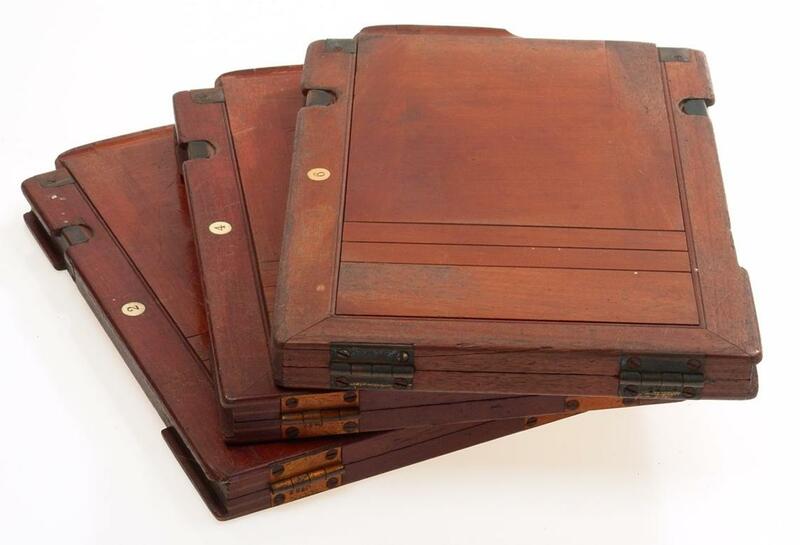 Households had rich bound albums containing their collections. Having your own portrait in the albums of others was a mark of acceptance and a snub if yours was not present! ​By 1866 Marion & Co were wholesale publishers of cartes of celebrities of the time featuring portraits by the studios of top London photographers, such as George Mayall. The sales of these reached phenomenal volume. For example the portrait of Prince Albert, following his death in December 1861, led to a rush on cards featuring him. In one week alone Marion & Co were said to have received orders for seventy thousand cards. Solidarity with the grieving queen was manifested in orders from Marion of Mayall’s portrait of her. It is said that Marion & Co paid a high royalty of £400 per 10,000 cartes sold. (which equates to around £40,000 today). The Queen was an avid collector too. One of her ladies- in- waiting wrote in 1860 “I have been writing to all the fine ladies in London for their and their husbands’ photographs, for the Queen. I believe the Queen could be bought and sold for a photograph.”. So what is all this to do with Honeywood? The connection with Marion & Co comes through Honeywood’s owner John Pattinson Kirk. The Friend’s web-site will tell you that the deeds to Honeywood show that by 1779 there were two houses standing side by side at the west end of the ponds. Our building was the northernmost of the two, and in the mid-19th century it was called 'Wandle Cottage'. The other house stood between our building and Pound Street and was then called 'Honeywood'. In 1883 the freehold of both properties came into the hands of Kirk, who had already acquired leases on both of them. Very little is known about him. He was born at Alston in Cumberland around 1836 and his wife Leah was born in Birmingham in 1856. In the 1881 census he is described as a merchant. Kirk had a town house in Soho Square, London and probably used Honeywood as a country retreat. The connection has now become much more apparent. He demolished the original Honeywood around 1883/4 and c.1895 he transferred the name to our building, which has been called 'Honeywood' ever since. At first it was thought that he was a junior partner who had obtained his position through the sales side of the business. However, with the recent digitization in the United States of The Directory of Gold & Silversmiths, Jewellers, and allied traders 1838-1914 it was confirmed that Marion & Co had their first mark entered by John Pattinson Kirk, described as managing partner (23.5.1890). It also confirms what was already known, that Marion & Co also had a factory at Southgate where they produced photographic plates and dark room accessories. Marion’s were a leading retailer and wholesaler of fine cameras and lenses. They provided a vast range of equipment and even gave photography training to clients. Eventually they had their own range of fine cameras sporting the Marion & Co badge. Whilst leading cameras by manufacturers such as Lancaster and Thornton Pickard and Sandersons etc. those sold under the Marion brand tend to be rare. They also produced lenses under the Soho brand name and a later range of Soho cameras. 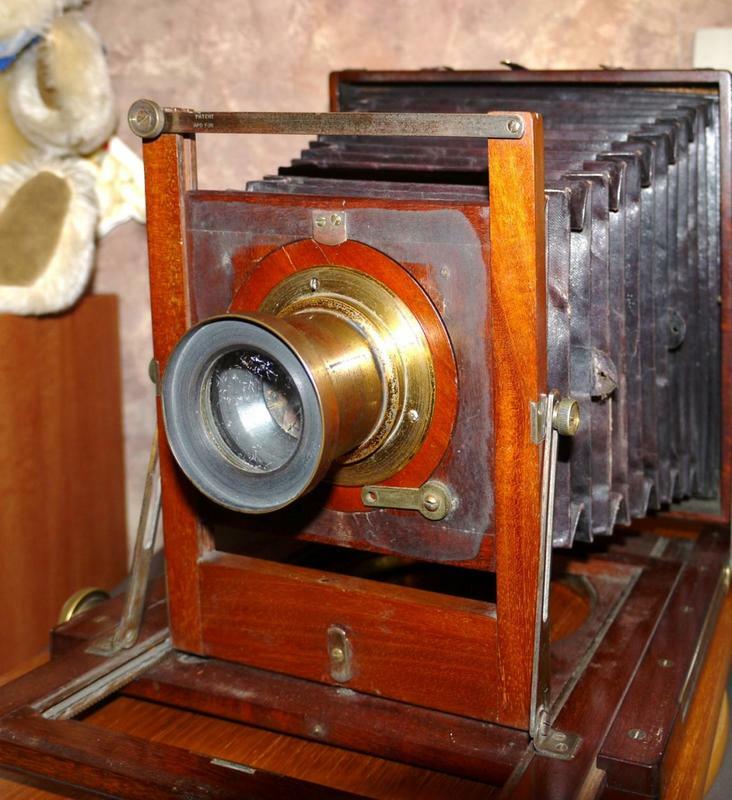 We came across a Marion ‘Perfection’ camera dating from around the 1880s for sale. A successful bid by The Friends of Honeywood Museum acquired this for display at Honeywood. The Perfection Camera (highly finished, and of best quality mahogany) - with 3 double backs and folding tripod stand (ash). A very strong camera, and yet a very light camera. A very short focus, with no bottom board projecting; yet it has a very long focus when racked out. All movements easily effected. Rising and swing front, double swing back. Camera fixed on stand with patent turntable. Every desirable movement has been provided for in the most practical way; hence its name – The Perfection Camera. Price with three double backs (made to a Gauge, so extra backs can be at any time ordered and will fit), and with folding tripod stand for plates 8½” x 6½” best finish £9.15s. ​The Perfection The Friends purchased is a larger Full Plate version, with a Marion leather case and four double back plates. Having purchased the camera we went in search of a lens. 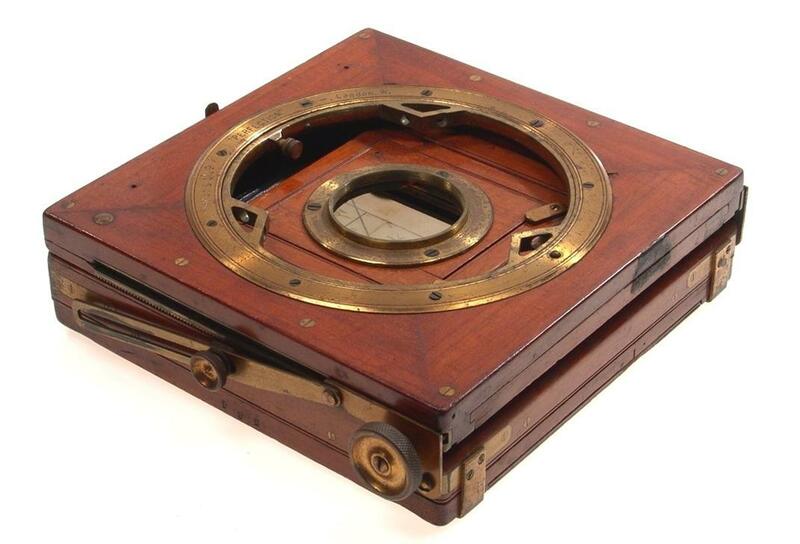 Two Marion examples proved beyond reach but the very helpful manager of a leading antique camera specialist came to our aid and supplied a suitable lens and mount to complete an authentic display. Because of our charitable status he was good enough to let us have the lens at well below market price. Finally, we have also sourced a range of complimentary cdvs (mostly marked Marion) and a good example of a Marion cabinet card. All of which adds to the story of the house and has made what it is proving to be a very popular and interesting display in the Billiards Room.